“The implementation of the contract has begun, the first shipment has been sent to China,” the source said. According to the source, the shipment includes a control station, a radar station, energy and support equipment, spare parts, various tools and other elements of the S-400 system. The source also said that the contact with China stipulated neither technology transfer nor licensed production. In 2017, Russia trained a group of Chinese military servicemen to use the S-400 systems. Meanwhile, Russia’s Federal Service for Military-Technical Cooperation has declined to provide any comments. Contract with China: In November 2014, it was announced that Russia and China had signed a contract on S-400 supplies, and in November 2015, Russian Presidential Aide on Military Cooperation Vladimir Kozhin confirmed the contract. In June 2016, head of Russia’s Rostec State Corporation Sergei Chemezov said that the Chinese Army would receive the S-400 systems no sooner than 2018. On December 7, 2017, Chemezov said that the delivery would begin in the near future. China is the first foreign purchaser of these air defense systems, while the second one is Turkey. In July 2017, Turkish President Recep Tayyip Erdogan stated that “certain documents” concerning the purchase of the S-400 systems had been signed. On September 12, 2017, Russia confirmed that a contract had been made. Turkey is the first NATO member state to purchase the S-400 Triumf systems. 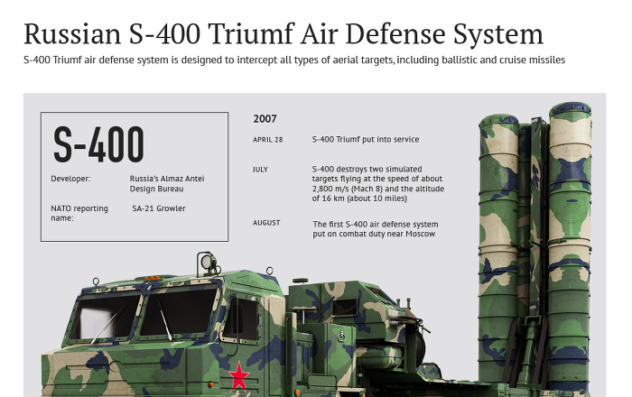 The S-400 Triumf (NATO reporting name: SA-21 Growler) is the most advanced long-range antiaircraft missile system that went into service in 2007. It is designed to destroy aircraft, cruise and ballistic missiles, including medium-range ones, and can also be used against ground objectives. The S-400 complex can engage targets at a distance of 400 km and at an altitude of up to 30 km. At present, only Russia’s Armed Forces are equipped with the S-400 systems. There are plans to supply them to four countries – China, Turkey, India and Saudi Arabia. Looks like China is calling the system, “Tomb Stone”….name for the Multimode Engagement Radar..
Oh My! – This is extremely dangerous to our democracy! Yes the Main Stream Media/News is extremely dangerous to our democracy!